Bakers are some of the greatest artists in the world. Like any great artists, we need the best candy making equipment possible in order to make great works of art. 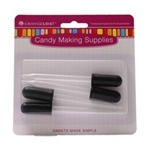 Sweet Treat Supply is proud to offer candy flavoring droppers and caps as well as plastic squeeze bottles, all crucial tools in every baker’s arsenal. 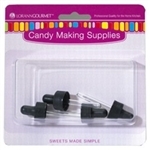 Our candy droppers are perfect for adding just the right amount of coloring you need to your small and large desserts. They are also great for adding filling to the center of your candy. All of our droppers are professional quality for the home kitchen and can be washed and reused many times. Plastic bottles can be filled with candy melts to help you control you pours into chocolate molds. At Sweet Treat Supply, we work hard to offer you candy droppers and plastic bottles at the lowest possible prices. We believe no baking artist should be prevented from making art because of expense. We’re confident that our candy droppers will help you make amazing desserts that will make your loved ones and the world smile. Shop today to save with our free shipping on every order of $100 or more!